Now if one assumes that the "microcephalin variant could have arisen anywhere from 14,000 to 60,000 years ago", possibly could correspond to the "Big Bang" or "Fortuitous Mutation" that Richard G. Klein refers to in his book "The Dawn of Human Culture" and says occurred about 50,000 years ago. Then, what about the "ASPM variant ranged from 500 to 14,000 years" ago and "roughly correlating with the development of written language, spread of agriculture and development of cities" as proposed. Genesis 2:15 And the Lord God took the man, and put him into the garden of Eden to dress it and too keep it." Genesis 3:23 Therefore the Lord God sent him forth from the garden of Eden to till the ground from whence he was taken." Genesis 4:2 And Abel was a keeper of sheep, but Cain was a tiller of the ground." From all these definitely established facts the importance of Asia as the primary home of the greatest majority of cultivated plants and domesticated animals is quite clear." More recent studies conducted by Melinda A Zeder and Brian Hesse (Science 287 (2000) 2254-57) place the initial domestication of goats to the Zargos Mountains at about 10,000 years ago. In more recent studies they have adjusted the dates slightly and now place domestication of sheep and goats at 11,000 years ago, pigs at 10,500, and cattle at 10,000. "The earlier dates mean that animals were domesticated at much the same time as crop plants, and bear on the issue of how this ensemble of new agricultural species – the farming package known as the Neolithic revolution – spread from the Near East to Europe." And Manfred Heun's (Science 278 (1997) 1312-14) studies indicate that large scale wheat cultivation began from 8,000 to 9,000 years ago near the Karacadag Mountains. Both areas are very near where the Tigris and Euphrates Rivers come close together. "The cradle of agriculture generally has been placed in the Jordan Valley of the southern Levant (today's Israel and Jordan). But work by Simcha Lev-Yadun of Israel's Agricultural Research Organization and colleagues suggest the first farms may have been farther north, between the Tigris and Euphrates rivers in what is today northeastern Turkey and northern Syria. Wild progenitors of the main Neolithic founder crops (einkorn wheat, emmer wheat, barley, lentil, pea, chickpea, bitter vetch, and flax) are found together only in this small core area of the Fertile Crescent. Lev-Yadun reports that wild chickpea especially is extremely rare, yet it was a staple crop of Neolithic life 10,000 years ago. Agriculture, therefore, probably began in an area where chickpea is native. Archaeological evidence shows that the earliest known farming settlements of the Fertile Crescent were in this core area. Also, the limited genetic variability of these crops implies that they were domesticated only once — rather than by several different cultures at roughly the same time. Evidence of domesticated crops in the core area dates to about 10,000 years ago, while the earliest signs of farming elsewhere are about 9,300 years ago. that they found a plain in the land of Shinar, and they dwelt there. Genesis 11:9... "the name of it called Babel; because the Lord did there confound the language of all the earth; and from thence did the Lord scatter them abroad upon the face of the earth. Are there any other evidences ? 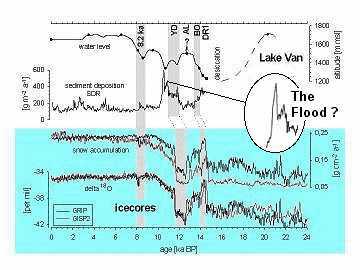 Looking at the Greenland ice core data and Lake Van varve data as follows. We see a brief warm period from about 15,000 to 14,000 years ago, followed by a cooling period and then the even greater cooling of the Younger-Dryas period from about 13,500 to 12,000 years ago. Now what would greatly increase the toil of a group of farmers more than a period of severe climate? 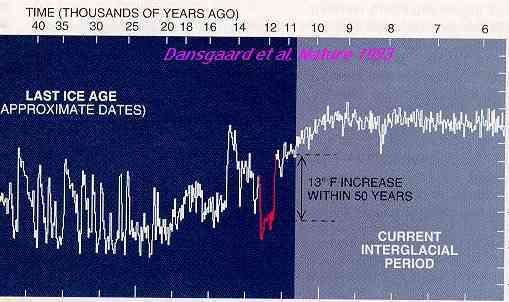 So it would seem that one could conjecture that the period of the garden of Eden was the relatively warm period of about 15,000 to 14,000 years ago when Adam started farming and then this was followed by the cool period of from 14,000 years ago to about 12,000, "the curse of the ground" a period in which farming was more difficult. Then about 12,000 years ago the warming up begins and farming becomes easier and proliferates. As already shown the data on the farmers indicates that the after the flood Genesis history took place in the Ararat area and that the area is also the origin of many of the known farm crops and domesticated animals. 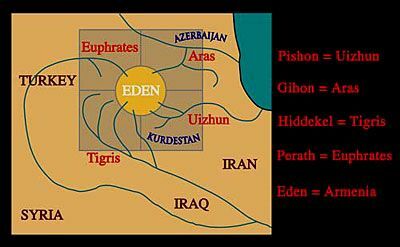 Also all four of the rivers of Eden listed in Genesis 2:11-14 can be readily identified, the "Perath, Hiddekel, Gihon and Pishon"
"Hiddekel is Hebrew for Sumerian Idiglat from which the Greek Tigris derives." Gihon; "... the River Aras, flowing into the Caspian Sea from the mountains north of Lake Urmia, was once called the Gaihun. By checking the writings of the Islamic geographers who accompanied the Arabic invasion of Persia in the 8th century, I was able to confirm that this was indeed the case. Moreover, even as late as the last century, Victorian atlases and encyclopaedias were still naming the river as the Gaihun-Aras. The Gaihun is therefore the missing biblical Gihon." "Pishon - "Hebrew (West Semitic) name derived from the old Iranian Uizhun, where the Iranian vowel 'U' had been converted into the Semitic labial consonant 'P'. Thus we have Uizhun to Pizhun to Pishon. Strange as it may seem, such switches do occur between the two language groups. For instance, one archaeological site in Iran is known by its Arabic (West Semitic) name of Pisdeli whereas its ancient (Iranian) name was Uishteri. The river Uizhun (the modern Qezel Uzun) - thus identified as the biblical Pishon - flows down from the mountains of Kurdistan and empties into the southern basin of the Caspian Sea." See "The Road to paradise" for more information. ... let them have dominion over the fish of the sea, and over the fowl of the air, and over the cattle, and over all the earth, and over every creeping thing that creepeth upon the earth. And God said, Behold, I have given you every herb bearing seed, which is upon the face of the earth, and every tree, in the which is the fruit of a tree yielding seed; to you it shall be for meat. The human brain may still be evolving. So suggests new research that tracked changes in two genes thought to help regulate brain growth, changes that appeared well after the rise of modern humans 200,000 years ago. "There's a sense we as humans have kind of peaked," agreed Greg Wray, director of Duke University's Center for Evolutionary Genomics. "A different way to look at is it's almost impossible for evolution not to happen." Still, the findings also are controversial, because it's far from clear what effect the genetic changes had or if they arose when Lahn's "molecular clock" suggests — at roughly the same time period as some cultural achievements, including written language and the development of cities. Lahn and colleagues examined two genes, named microcephalin and ASPM, that are connected to brain size. If those genes don't work, babies are born with severely small brains, called microcephaly. Using DNA samples from ethnically diverse populations, they identified a collection of variations in each gene that occurred with unusually high frequency. In fact, the variations were so common they couldn't be accidental mutations but instead were probably due to natural selection, where genetic changes that are favorable to a species quickly gain a foothold and begin to spread, the researchers report. For the microcephalin gene, the variation arose about 37,000 years ago, about the time period when art, music and tool-making were emerging, Lahn said. For ASPM, the variation arose about 5,800 years ago, roughly correlating with the development of written language, spread of agriculture and development of cities, he said. "The genetic evolution of humans in the very recent past might in some ways be linked to the cultural evolution," he said. Lahn's own calculations acknowledge that the microcephalin variant could have arisen anywhere from 14,000 to 60,000 years ago, and that the uncertainty about the ASPM variant ranged from 500 to 14,000 years ago. Those criticisms are particularly important, Collins said, because Lahn's testing did find geographic differences in populations harboring the gene variants today. They were less common in sub-Saharan African populations, for example. "There's just no correlation," said Duke's Wray, calling education and other environmental factors more important for intelligence than DNA anyway. The work was funded by the Howard Hughes Medical Institute. All other Indo-European languages split off from Hittite, the oldest recorded member of the group, between 8,000 and 10,000 years ago, the pair calculates1. The conclusion will be controversial, as there is no consensus on where Indo-European languages came from. Some linguists believe that Kurgan horsemen carried them out of central Asia 6,000 years ago. "No matter how we [changed] the analysis or assumptions, we couldn't get a date of around 6,000 years," says Gray. "This kind of study is exactly what linguistics needs," says April McMahon, who studies the history of languages at the University of Sheffield, UK. It shows how ideas about language evolution can be tested, she says: "Linguists have always been good at coming up with bold hypotheses, but they haven't been terribly good at testing them." But the technique is still fraught with difficulties, McMahon warns. There is lots of word-swapping within language groups. English took 'skirt' from the Vikings, for example, but 'shirt' is original. Linguists must separate the shared from the swapped, as any error will affect later studies. The Kurgan might not be out of the picture entirely, says McMahon - they may have triggered a later wave of languages. "This isn't going to knock the debate on the head," she says. Biology and linguistics can learn a lot from each other, comments geneticist David Searls of GlaxoSmithKline Pharmaceuticals, based in King of Prussia, Pennsylvania. "There may be some fundamental principles of evolution of complex systems, such as languages and organisms," he says. Gray, R. D. & Atkinson, Q. D. Language-tree divergence times support the Anatolian theory of Indo-European origin. Nature, 426, 435 - 439, doi:10.1038/nature02029 (2003). The snow-covered dome of the Mountain of God, shrouded in billowing clouds, towered above the old Mongol village known locally as 'the honeycomb'. Earlier that morning I had set out on a pilgrimage to the Exalted Throne of Yahweh where Adam's god dwelt. Within an hour the noise and chaos of Tabriz had been left far behind, as our four-wheel drive ascended out of the alpine valley of the Adji Chay onto the plateau of the Sahand massif, with imposing volcano at its heart. Now I found myself at the entrance to one of our world's most extraordinary places - the troglodyte village of Kandovan. Ambling down the cobbled street - only just wide enough to take a donkey and cart - I turned up a steep side alley, all the time stalked by a clutch of free-roaming chickens. The alley soon morphed into a roughly sculpted flight of steps which twisted and turned between huge canine teeth of lava. Each was a home - a dwelling from a bygone age with rickety wooden door and tiny mullioned windows. In this Dysneyesque landscape of cave-dwellers, I almost expected Pinocchio to appear around the next bend. There is no straightforward way to explain how an Egyptologist, used to working in the dry heat of the north African deserts, should end up traversing the Zagros mountains of western Iran in search of the earthly paradise. I had begun my studies in the Departments of Egyptology and Ancient History at University College, London, with a major interest in the complex chronology of Egyptian civilisation. My PhD work to radically revise that chronology had inevitably drawn me into the world of biblical history - so closely bound up with the land of the pharaohs. Years of research had led me to the conclusion that many of the stories in the Old Testament were based on real historical events: the Israelite sojourn in Egypt, the Exodus, the conquest of the Promised Land - all were attestable within the archaeological record once the correct chronology had been applied. But why was I now delving into the Book of Genesis - that most mythological and hoary of the biblical texts? Surely it would have been better to leave well alone? But that is not my way. The simple fact is that ancient stories and legends have always fascinated me and the chance to uncover the historical reality behind the greatest legend of them all was just too tempting an opportunity to pass by. The 'Temptation Seal' on display in the British Museum. Back in 1987 I had been sent a short, privately published paper by amateur historian, Reginald Walker (1917-1989), which proposed a location for the Garden of Eden in north-western Iran. The main thrust of Walker's argument was that the four rivers of Eden, described in Chapter Two of Genesis, were to be found in that region. All four had their sources (the Bible refers to them as 'heads') around the two great salt lakes of Van and Urmia. Ever since the time of the Jewish historian Josephus, a near contemporary of Christ, scholars have tried to use Genesis 2 to locate Eden. But the problem has always been the identification of the rivers themselves. The Bible calls them Perath, Hiddekel, Gihon and Pishon. The first two are no problem: the Perath is simply the Hebrew version of Arabic Firat and Greek Euphrates; similarly the Hiddekel is Hebrew for Sumerian Idiglat from which the Greek Tigris derives. The remaining two rivers, however, have always been a mystery. Clearly, in order to locate Eden precisely, we need to find the sources of all four - and that's where Walker's research comes in. The fourth river - the Pishon - was more difficult to find. Walker suggested that this Hebrew (West Semitic) name derived from the old Iranian Uizhun, where the Iranian vowel 'U' had been converted into the Semitic labial consonant 'P'. Thus we have Uizhun to Pizhun to Pishon. Strange as it may seem, such switches do occur between the two language groups. For instance, one archaeological site in Iran is known by its Arabic (West Semitic) name of Pisdeli whereas its ancient (Iranian) name was Uishteri. The river Uizhun (the modern Qezel Uzun) - thus identified as the biblical Pishon - flows down from the mountains of Kurdistan and empties into the southern basin of the Caspian Sea. An extra-biblical Sumerian epic known as 'Enmerkar and the Lord of Aratta' relates the tale of a journey made by the envoy of Enmerkar, King of Uruk, from his home city in southern Mesopotamia, through the seven high passes of the Zagros range and down into the magical kingdom of Aratta - the 'Eldorado' of the ancient world. Enmerkar was the second ruler of Uruk after the Flood, according to the Sumerian King List. A crucial line in the epic describes the envoy descending from the last of the seven mountain passes (the Sumerians called them 'gates') and crossing a broad plain before arriving at the city of Aratta with its red-painted city wall. Here, the Sumerian word for 'plain' is edin which some scholars believe is the source of the word Eden in Genesis. 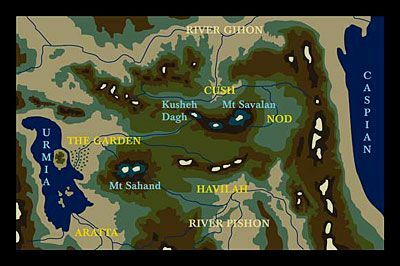 So, combining Walker's discovery of the four rivers together with the Sumerian location of Eden, it seemed as though the whereabouts of the lost Eden and its fabled garden was near to being resolved. I decided to set out for the ancient city of Susa (burial place of Daniel of the lions' den) in the south-western flood plain of Iran (Iraq was off bounds for obvious reasons) from where I determined to retrace the Sumerian envoy's route to paradise. Following the ancient track through the seven 'gates', I eventually reached the Miyandoab plain to the south of Lake Urmia. The journey had taken four days by car but would have taken the envoy the best part of four months by donkey. The edin remains today one of the lushest regions of the Middle East: thick soil, fruit orchards and vineyards, lazy meandering rivers. This, I am sure, was the original heart of Eden which, over time, became a much wider area, including both the salt lakes and the Garden of Eden itself. The Bible describes the latter as being 'east in Eden' - in other words to the east of but still within the wider territory of Eden. All around a high snow-laden ring enclosed the valley, nurturing its warm micro-climate. The nearest mountain to the north glowed bright red in the low evening light - a pile of pure red ochre. At its foot sprawled the regional capital of Tabriz, squatting at the centre of the valley where Adam and Eve (whoever they were) once lived according to biblical tradition. The first thing which came to mind was paradise lost. Nothing of the earthly garden and its settlement could have survived beneath these bustling streets. But then, away from the city, I soon discovered that there was much that remains of Adam's Neolithic culture. 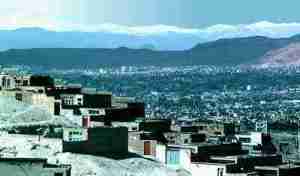 Paradise Lost - the sprawling city of Tabriz. This was the region where Man first began to settle down to sedentary life; where he learnt to domesticate animals and plant his crops; and where he began to bury his dead in graves, the bones painted in red-ochre. Adam's name means the 'red-earth' man. According to Sumerian mythology, Man was crafted by the gods from the clay of the earth, just as a potter throws his red clay pots on the wheel. The creation of Man in Genesis is much the same. Here the word 'dust' is a poetical translation. The understanding of Hebrew aphar is the earth from which clay is made, or simply clay itself, and I believe the clay which gave Adam his name was sourced in the red mountain looking down on Tabriz. Throughout many prehistoric cultures (and including the later Mesoamerican civilisations such as the Maya) the daubing of human bones in red paint or powder was a substitute for the life-blood which had been lost with the decaying flesh. The Hebrew word for 'garden' used in Garden of Eden is gan which has the meaning 'walled' or 'enclosed garden'. The enclosed valley of the Adji Chay is just that - a rich-soiled paradisiacal haven protected by high mountain walls. The Greek version of the Old Testament calls the Garden of Eden 'Paradise' (paradeisos) after the ancient Persian pairidaeza meaning 'enclosed parkland'. The great Meidans (royal squares) of Islamic Persia, particularly the beautiful Meidan-é Imam of Isfahan, are symbolic representations of the original Garden of Eden with their high enclosures and formal gardens containing fountains and pools. When the descendants of the Mongol chieftains who had invaded Persia in the 13th century moved on into India to become the Mogul emperors of the 16th to 19th centuries, they took the Persian ideas relating to the Garden of Eden with them. So it was that Shah Jehan built the Taj Mahal for his beloved queen, Muntaz Mahal, not simply as a mausoleum but as a representation of heaven itself - with the mausoleum functioning as the Throne of God. Jehan was effectively recreating the paradise on earth which had been lost to humanity following the expulsion of Adam and Eve from the Garden of Eden. A study of the Koranic inscriptions around the arches of the Taj, undertaken by Professor Wayne E. Begley of Iowa University, has shown that this was the hidden secret of the building - the sacred knowledge of Eden brought out of Sufic Iran. 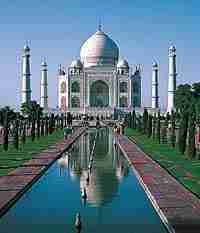 The Taj Mahal - an architects reconstruction of Eden. However, now that the landscape of Eden and its garden have finally been identified, I believe we are in a position to read much more into this extraordinary 17th-century monument to one man's vanity. The Taj Mahal's glistening white dome, can be seen as a representation of the snow-capped Mount Sahand - the original exalted throne of God. The formal gardens in front of the Taj mirror the garden of paradise with the central pool (representing Lake Urmia) and the four water channels (representing the four rivers of Eden) flowing out from the centre of the complex. The ornamental arch leading into the enclosed garden of the Taj Mahal represents the mountain pass or 'gate' leading into Eden which was ferociously guarded by the cherubim and the Fiery Flashing Sword. The symbolism is striking. But, back in the real Garden of Eden, we still have much more to discover. Even further to the east of the Adji Chay valley and Tabriz, beyond a high pass leading out of the Garden of Eden, is the land of Nod into which Cain was exiled after he had murdered his brother Abel. The area is still today called Upper and Lower Noqdi and many villages bear the epithet Noqdi ('belonging to Nod'). In the same region we find the town of Kheruabad. The name means 'settlement of the Kheru-people' and the Kheru were the Kerubim (Cherubs) of Genesis who protected the eastern entrance into Eden. The volcanic peak which guards the eastern gateway back into the Garden of Eden is a good candidate for the 'Fiery Flashing Sword' associated with the Kerubim. When I travelled over the pass beneath Savalan volcano for the first time, the vehicle was pounded by a violent electrical storm. To the ancients, used to the metaphor of jagged peaks as divine swords or spears, it would have been easy to envisage the angry mountain, casting down its bolts of lightening, as the Fiery Flashing Sword of Genesis. I returned to Eden from Nod by a different route, travelling along the valley of the Ahar Chay - the next river basin north of the Adji Chay. 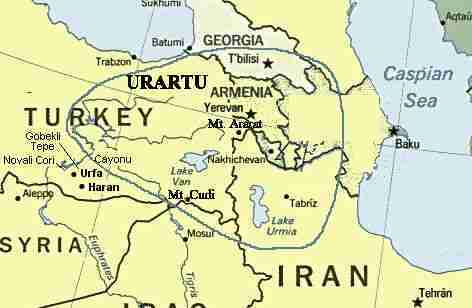 The Ahar Chay is a major tributary of the Gaihun-Aras/Gihon which, according to Genesis 2 'winds all through the land of Cush'. My map confirmed once more that we really were in the primordial landscape of Adam and Eve. Separating the Ahar and Adji valleys, and acting as the northern wall of the Garden of Eden, stretched a high snow-capped ridge named Kusheh Dagh - the 'Mountain of Cush'. 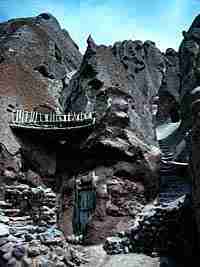 The troglodyte village of Kandovan seems as old as the mountain to which it clings. We can certainly record its history back to the Mongol invasion of Persia in the 13th century when a group of settlers occupied the village. But none of today's locals have memories beyond the arrival of their Asiatic ancestors. Did the village exist before that time? It seems highly likely, given the complex agricultural terracing which covers the steep-sided valleys around the holy mountain. Assyrian war annals of the 8th century BC mention towns in the vicinity of Mount Uash (the Assyrian name for Sahand volcano) and these population centres would have required considerable agricultural produce which must have been eked out of the volcanic soil clinging to the slopes of Sahand. 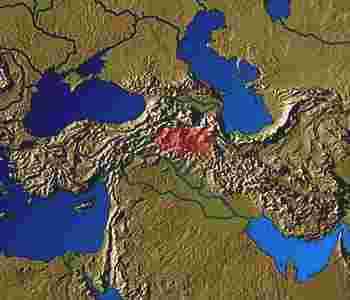 Beyond the 8th century BC we cannot go with any certainty, but Neolithic occupation around Lake Urmia and Mount Sahand has been confirmed by limited archaeological investigations. Of the thousands of ancient occupation mounds surveyed in this region only a tiny percentage have been excavated. We have just begun to scratch the surface in the land where human civilisation began. Whatever the ancient history of Kandovan, the soul of the place is timeless. Hardly anything has changed over the centuries - until very recently, that is, when electricity was piped up from Tabriz. The only other concession to the modern world is a fag shop and a picnic area for Tabrizi weekend tourists. They come up the mountain armed with plastic containers to collect the water which flows down from the nearby summit of the mountain. This water is regarded as having magical properties: it cures the sick and prolongs life. Many a grandma or grandpa in Tabriz are fed the holy water of Mount Sahand to keep them fit and strong. 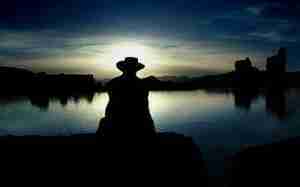 The reason for this veneration is all to do with the sacred source of the river which runs through the Garden of Eden. At the summit of one of the two peaks of Sahand the extinct volcanic chimney overflows with ice-cool water as if from a bottomless well. The locals call it Jam Daghi - 'Mountain of the Chalice'. The water which gurgles from the tiny lake joins other streams, flows past Kandovan and on down into the Adji Chay valley, eventually forming a marshy delta on the eastern shore of Lake Urmia. In Sumerian theology spring-water lakes on top of mountains were regarded as holy places where humans might communicate with the great god of the underworld ocean of sweet water upon which the earth floated. Such an interface between the worlds of the living and dead was called an abzu, from which we get our word abyss. 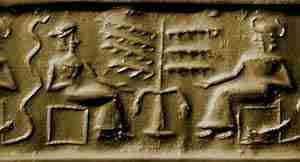 The god of the abzu was known to the Sumerians as Enki ('Lord of the Earth') - the creator of humankind and the 'friend of Man'. The Akkadians and Babylonians knew him as Ea (pronounced Éya) and it was this Ea who warned the Mesopotamian hero of the flood of the impending destruction of mankind by the storm-god, Elil (Sumerian Enlil). Could Ea, god of the Sahand abyss, have been the deity worshipped by Adam and Noah? You will have to wait for another day for the story of the flood when I will reveal the hidden name borne by the god of the Israelite ancestors. Meanwhile, the troglodyte village of Kandovan with its volcanic spires was as close as I could get to Adam's world. I had travelled over one thousand kilometres from the Mesopotamian plain to the Garden of God. I had crossed seven mountain ridges, through the ancient lands of Kuzestan, Luristan and Kurdistan. I had followed in the footsteps of Enmerkar's weary envoy as he crossed over into the mysterious land of Aratta and, beyond, I had found myself in the primeval world of Adam and Eve. I was literally in Seventh Heaven. My journey had come to an end just below the summit of God's holy mountain. The Exalted Throne of God was within reach, a thousand metres above me, but sadly not this time. Dark clouds had enveloped the mountain and falling snow began to shroud the way forward. My meeting with God would have to wait for another time. I headed down the mountain, leaving Pinocchio and his friends to their own devices. "Since Israel attained its independence (May 14, 1948), the total area under cultivation has increased from 408,000 acres (165,000 ha.) to some 1.07 million acres (435,000 ha. ), and the number of agricultural communities has grown from 400 to 725. During the same period, agricultural production has expanded 16-fold, more than three times the population growth." "Israel's Agricultural Exports: Total: $590 million"
And I will plant them upon their land, ..."